대불정여래밀인수증료의제보살만행수능엄경(언해) 권7, 8 (大佛頂如來密因修證了義諸菩薩萬行首楞嚴經(諺解) 卷七, 八)은 당나라의 반자밀제(般刺密帝)가 번역하고 송나라의 계환(戒環)이 해설한 것을 한글로 풀이한 것이다. 볏짚과 닥나무를 섞어 만든 누런 종이에 찍어낸 세로 37.5㎝, 가로 23.8㎝ 크기의 활자본으로, 전 10권 중 권7과 권8이 2권의 책으로 전해진다. 활자본은 글자를 하나하나 파서 고정된 틀에 끼우고 찍어내는 것을 말하며, 을해년에 만들었다고 하여 을해자본(乙亥字本)이라고 한다. 을해자본은 원래 세종 31년(1449)에 수양대군(세조)이 왕명으로 번역에 착수한 것인데, 마무리를 못하고 미루어 오다가 세조 7년(1461)에 유명한 승려와 유학자들을 총동원하여 완성하고 찍어낸 것이다. 을해자본은 간경도감에서 불경을 간행하는데 기준이 되었으며, 남아있는 활자본이 적어 귀중한 자료로 여겨진다. 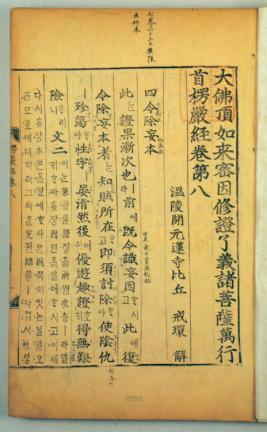 Neungeomgyeong, or Suramagma Sutra, is the basic text that monks study in the course of their discipline. The main idea of the sutra is to understand what Buddha says by practicing it. It consists of sutras translated from the originals made by Zen monks of the Tang and Sung Dynasties, and these are the 7th and 8th books out of 10. 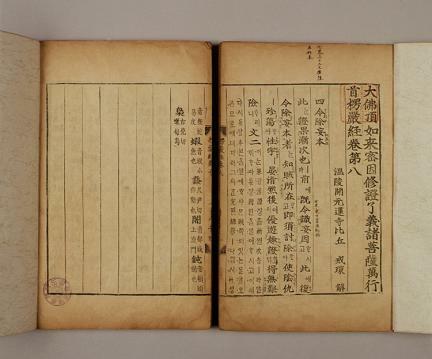 They are woodblock-printed books, measuring 37.5cm in length by 23.8cm in width. They is also called Eulhaejabon, because they were made in Eulhae year, the 12th binary term of the sexagenarian cycle. Begun in the 31st year of the reign of King Sejong (1449) of the Joseon Dynasty by Prince Suyangdaegun, later King Sejo, they were completed in the 7th year of King Sejo's reign (1461) with the help of prominent monks and Confucian scholars. 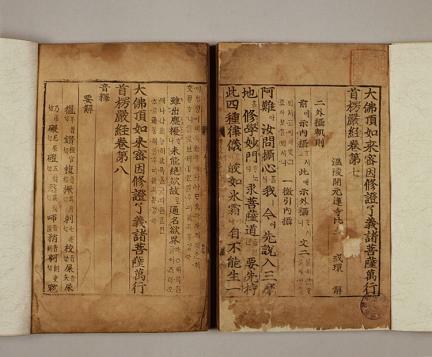 Gangyeongdogam, the place where Buddhist scriptures were translated into Korean and published, used this as exemplary material and this is a particularly valuable example because it is one of few printed books remaining.